Noisy, brash, and opportunistic, the Common Grackle doesn’t always get a lot of love – not least from farmers lamenting a big flock descending on their cornfields. While the bird does cause significant agricultural damage in places, it’s also an essential element of the ecosystem as an omnivorous and numerous forager and fertilizer – which makes the marked decline in Common Grackle numbers noted in recent decades worrisome. It’s a downward trend not clearly understood, which is partly a reflection of the Common Grackle’s “understudied” status (as Ecology and Management of Blackbirds in North America notes) despite its broad geography and visibility. Even amid that population decline, Common Grackles remain numerous in many parts of central and eastern North America, and where it’s present this sociable icterid (a member of the New World bird family that includes blackbirds as well as orioles and meadowlarks) certainly makes a conspicuous presence on the landscape. Both sexes are glossy and mainly black-feathered, but the male is more iridescent and richly tinted with a blueish or purplish head. 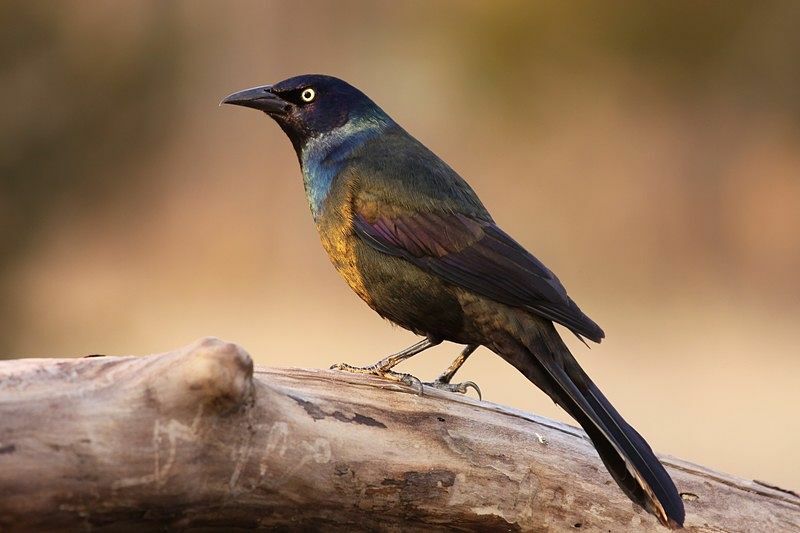 Two male color morphs are widespread: the “Bronzed” Grackle of interior North America, with a bronze cast to the body, and the “Purple” Grackle of the coastal Southeast, with a more purple and/or green sheen. The heads of both these morphs are the characteristic blue-black or purple-black. During the summer molt, the Common Grackle will often appear notably stubby-tailed, though sometimes (as David Allen Sibley notes in his Sibley Guide to Birds) a molting adult grackle retains its long tailfeathers. Juvenile grackles, meanwhile, have dark eyes and a duller, less contrasting body. As we’ve mentioned, adult Common Grackles are fairly easy to pick out among the smaller blackbirds they often flock with. Meanwhile, there are two other grackle species you’ll want to consider when making an I.D., though here again a little practice should minimize confusion. Both the Boat-tailed Grackle of the coastal Southeast and the Great-tailed Grackle of the southern Plains and Southwest are dramatically larger than the Common Grackle, and the males of both kinds (which have formerly been lumped together in the same species) also sport proportionately larger tails (hence the names). Female Great-tailed and Boat-tailed grackles are a bit closer in size to the Common Grackle, but they lack the contrasting dark head found in both males and females of the latter. Northern and western populations are considered short-distance migrants, traveling to wintering grounds in the core of the Common Grackle’s year-round range. Fall migration usually peaks in late October or early November, while spring migration takes place mostly in late February and March. Migrating grackles, like other blackbirds, travel by day and often in large flocks that roost together at night. Indeed, from fall through spring the Common Grackle is a sociable bird indeed, traveling in big flocks that often include other blackbirds as well as starlings; these aggregations may number in the thousands of even millions of birds. During migration season as well as wintertime, it’s common in grackle country to see (and hear) these impressive groups streaming toward their mass nocturnal roosts. Common Grackles are primarily birds of open or semi-open country: grasslands, fields, lawns, and marshes as well as airy brush and woodlands. Common Grackles are not picky eaters. These omnivorous icterids devote much of their menu to seeds, including (notoriously) cultivated corn and rice, but they’ll also munch on tree mast and fruits as well as a variety of animal matter. Such prey includes everything from insects and spiders to rodents, lizards, crayfish, frogs, and small birds, including hatchlings plundered from nests. Grackles will trail plows or livestock to pounce on flushed-up insects or small mammals, and have been known to rob American Robins and other birds of their catches. Common Grackles aren’t above scavenging garbage, either: an opportunistic eating habit they share with other highly successful omnivorous relatives as crows and gulls. Common Grackles commonly forage on the ground but will also hunt and pluck among shrubbery and trees, and occasionally wade into shallow wetlands. A harsh, creaky, half-whistled rasp defines the Common Grackle’s instantly recognizable song, which All About Birds likens to “a rusty gate.” It’s an arresting sound when issued solo, and downright extraordinary – if not exactly melodic – when you’re within earshot of a multitudinous grackle flock. In terms of calls, the Common Grackle makes a variety of choppy, rough chips and chatters. You can listen to examples of the Common Grackle call here. A male Common Grackle does his best to seduce a mate with his “rusty gate” song, delivered while fluffing up his feathers, spreading his wings and tailfeathers, and pointing his bill skyward. Males tend to arrive on breeding grounds about a week before females. Nesting typically takes place in small grackle colonies numbering anywhere from 10 to 30 mated pairs. Females build the cup-shaped nest out of twigs, leaves, grasses, and mud with a fine-textured lining. Conifers such as pines, spruces, Eastern Junipers, and Northern White-cedars appear to be especially favored for nesting sites, though grackles will also utilize hardwood trees and shrubs; they’ve been known to nest in birdhouses and on the ground, and even to set up maternal shop in the occupied nests of Great Blue Herons and Ospreys. Female grackles typically lay on the order of five eggs, which they incubate for 12 to 15 days. The nestlings – fed by both parents, that is if the male hasn’t ditched the scene as he sometimes does after egg-laying – fledge after some 16 to 20 days. Cornell Lab of Ornithology. All About Birds: Common Grackle. Linz, George M. et al. (editors). 2017. Ecology and Management of Blackbirds (Icteridae) in North America. CRC Press. National Audubon Society. Guide to North American Birds: Common Grackle. Hey Buddy!, I found this information for you: "The Common Grackle". Here is the website link: http://backyardbirdingblog.com/the-common-grackle/. Thank you.